Thank you so much for considering a partnership with the Academy of International Business – Southeast to make our 2014 Annual Conference a success. Our conference has seen incredible growth over the last five years and that is due in large part to the support of our corporate and academic sponsors. This year’s conference, in spectacular Miami, Florida, is expected to attract up to 300 scholars from over 40 different countries. It promises to be a great exchange of ideas and cutting-edge research in the international business field. We would like to work with you to continue this amazing growth and to create lasting value for the participants and your organization! 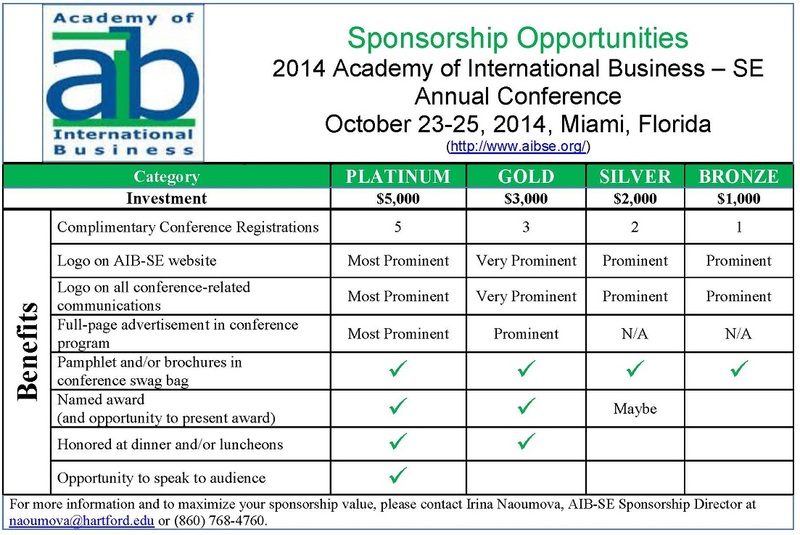 On behalf of the entire 2014 AIB-SE Conference Organizing Team, we would like to thank you for your support! We look forward to working with you to realize your sponsorship goals!